Once installed, solar pool heating costs nothing extra to run, as it works in conjunction with your existing pool pump system, ie when you have your pool pump on, the water will pass through the panels as well. The system is also fitted with a manual bypass valve so that you can isolate the panels in the middle of summer when the pool gets very warm. In order to make a significant difference to the temperature of your swimming pool, you will need at least half of the surface area of the swimming pool in panels. Please Note: Solar pool heating will extend your swimming season dramatically, but it will not make your pool useable 365 days of the year. 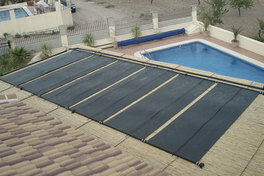 In order to receive the maximum benefit from solar pool heating, you will also need a solarweave pool cover (summer cover, on a roller that floats on the surface of your pool). The reason for this is because, if you assume that your pool starts at 20ºC and the panels increase that temperature on day 1 by 4ºC, but you lose up to 4ºC overnight on an uncovered pool, on Day 2 you will be starting from 20ºC again. 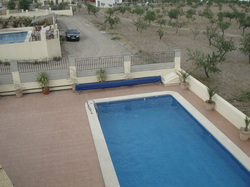 With a pool cover, you will lose less heat overnight, meaning you would be starting Day 2 on maybe 22ºC. The panels would then increase the temperature again, so by the end of day 2, you could have a temperature of 26ºC, and so on. 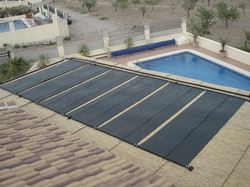 In short, without a solarweave pool cover you will only be increasing the temperature of your pool by a few degrees above what it would normally be without the heating.